Police hat how should be to technical specifications? Hats Band Material Properties method must be polyethylene. The weight of one military-police hat should be a maximum of 50 g. The hardness should be 52 + 3 Shore-D. That function test performed hats must not be breaking, cracking, and twisted. According to a first aspect must not soften and sag that heat resistance test applied hats. And the hats according to a first aspect must not be broken and hardening when applied to cold resistance test. Should not be any color bleeding and blurred color on hat performed dye stableness test. Hats pulley color should be at least three different color tone from the hat. Hats pulley used in SAE 1070 requires the use of metal strips made of quality steel. Most should be 2.2 + 0.2 mm. Thickness should be 0.7 + 0.1 mm. It must be covered over. The type coating material made should be polyethylene. The coated material thickness must be 0.5 to 0.7 mm. Clips type of material should be polyethylene or polyamide. The ends of the body of the hat hoop must be appropriate to enter into the clip. Thickness painted must be at least 0.5 mm. When bent manually opened ten time, there should not be blistering and flaking paint. Clips type of material should be made from AISI 304 stainless steel. Bale’s color difference level should be at least three tones. When resistance to hot test is applied, it should not be compared softening and sagging into the first. When the endurance test against the cold, should not be hardening and breaking. The soldiers hat used bien’s width should be 16-18 mm. Bia materials must be of the type of polyethylene or cotton. When the hat is passed through the ribbon trimmings, bias should not pinched and inserted into strips. 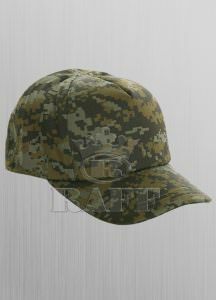 Hats color differences should be 4-5 tons from color of hat fabric. The front of the hat should be bright. Material type can be change according to the customer’s request. Hat’s color hues between the shield material color difference should be at least 4-5. Subjected to the endurance test of heat shield must not soften and sag on hat. According to its first state should be no hardening and breaking which endurance test against cold on visor. The top layer must be denominated in bright artificial leather material. The surface of the fabric must be coated polyvinyl chloride PVC. Upper layer thickness must be between 0.6 to 0.8 mm. The middle layer must be made of plastic. Middle layer thickness should be between 1.5 – 2 mm. The bottom layer should be done in terms of matte faux leather material. The surface of the fabric must be coated polyvinyl chloride PVC. The thickness of the substrate should be 2 + 0.1 mm. The layers are glued together. The upper and lower layers are joined together by sewing with the convex side glossy artificial leather strip. Number of stitches in the seam 10 cm Merge must be 30 + 5 pcs. When the two ends together touching its cracking, it must not break and tear. Should not be any color bleeding and blurred color on hat performed dye stableness test. It must be made of polyurethane. Measures must be thickness 5% 2+0,1.